BattleBlock Theater starts off simply enough: You and over 300 of your closest friends are out for a pleasure cruise aboard the S.S. Friendship. The Friendship is a mighty ship, not a boat, to be sure. Suddenly the ocean takes offense to all the fun you're all having and decides to go upside your collective heads, smashing your boat -I mean ship- into an island. You and your chums are taken prisoner by a pack of rather large and very irritable cats. 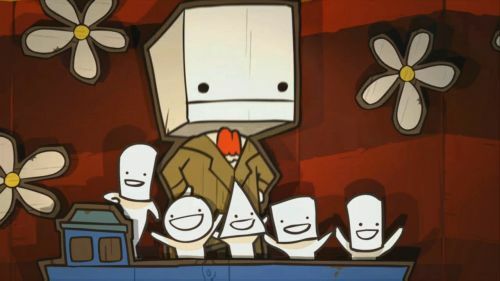 The most beloved member of your group, Hatty Hattington, is crowned their leader, for some reason or another, and you and the rest of the lot are left to perform horrific acts upon each other for the kitty monsters’ twisted amusement. Welcome to BattleBlock Theater, a fun, colorful platformer where you will be smashed, drowned, electrocuted, eaten, exploded, diced, and spiked. I’m sure there are a few more ways to die, but they escape me at the moment, much like you’ll be trying to escape the evil, clawed clutches of your feline jailers. 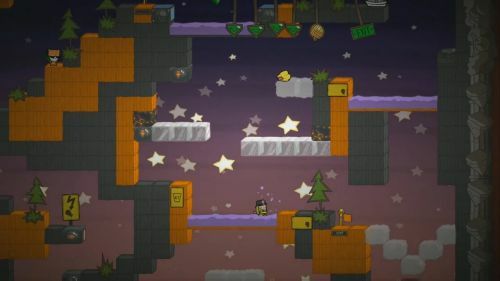 BBT is a platformer at its core, with several additional modes available in a multiplayer Arena. The story mode allows one or two players to cooperatively (online or locally) tackle eight chapters made up of over a dozen stages. In each stage players need to brave deadly hazards and collect a handful of gems. Capture enough gems and you'll open an exit and make your escape. You will then be graded on speed, how many gems you collected, and if you retrieved the single coveted ball of yarn hidden in each level. Stages are packed with different hazards, from laser cannons to spiked walls to armed kittens. There are also a number of special tools and devices that can aid players, like sticky walls, pop guns, exploding frogs, adorable tiny sail boats, and switches which can zap blocks in and out of existence. A charming narrator, who is almost too cute for his own good, will guide you through your adventure. All of the gameplay is wrapped in a whimsical, jazzy score that suits the light combat and speedy platforming perfectly. Death is quick, humorous, and painless. Checkpoints are numerous and forgiving. Sticking your own little character's face to a row of spikes is funny. Shoving your partner into that same wall of spikes is hilarious. On normal mode you have countless lives to lose for your captors' (and co-op buddy's) pleasure. I gladly sacrificed myself numerous times to take out an enemy or to grab a precious gem. Insane mode is another story. If you die in insane mode you get a one way ticket back to the start of the level. No checkpoints for you! The first half of the campaign is a walk in the park. The levels are well crafted, cleverly introducing different game mechanics as players progress through the colorful stages. Single player and co-op stages are similar, but different. Puzzles are altered so that two players are required to continue in the co-op campaign. This means that saved progress is specific to each mode. So you could be on 4-3 in your co-op session, but only have progressed to 2-5 in your single player game. Simply put, chapter progress in single player does not crossover to you co-op campaign, and vice versa. Not that it matters much. You'll most likely want to play through the game solo and cooperatively, because you'll want every single gem you can get your little greedy hands on. These gems are used to unlock other prisoners in the Gift Shop. They're imprisoned in giant vending machines like the ones we used to shove quarters into when we were kids. Once you set them free you can play as that character. It's a purely cosmetic change, but you'll become obsessed with getting all their heads for your collection. There are over 300 of them! You can also trade in your rare balls of yarn for a variety of weapons, including a vacuum cleaner, fireball, and boomerang. As good as BBT is, it's better with a pal. Players can throw each other across long gaps, activate switches for each other, pull each other up to new levels, and team up against bad kitties. The screen actually zooms out when two players separate, even when playing online. Players can hurt each other, but bashing your buddy is part of the fun. There's only one downside I've seen to BBT's co-op mode: It hurts the single player experience. BBT is a wild ride as a single player, and if you never play with another person you'll never know what you're missing. Once you team up with a co-op partner you'll find it's hard to go back to playing solo. Page created in 0.5017 seconds.